This polymer wall piece, Garden of the Hesperides, by Florida’s Jayne Hoffman suited the season and even though there are only small versions online, it felt right to share something Friday festive. 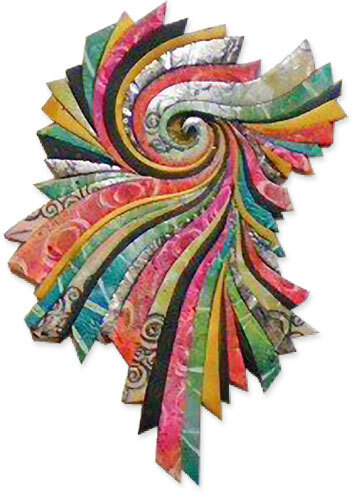 Individually cut strips of polymer clay were accented with inks, glitters and foils, textured and swirled next to each other giving the piece a quilt-like appearance. Jayne’s also working on some pencil-colored, inked and patinaed pendants found on her Pinterest site. Reminds me of New Years Eve and the fireworks!! Love how the piece flows! !